This award offers financial assistance to women who need education or skills training to enter or re-enter the workforce. The awards are designed to give women heads of household, who are the primary source of financial support for their families, the opportunity to achieve their career goals. Local recipients now receive $2,000 each from the Raleigh club. Award recipients are eligible for consideration for a Region award. 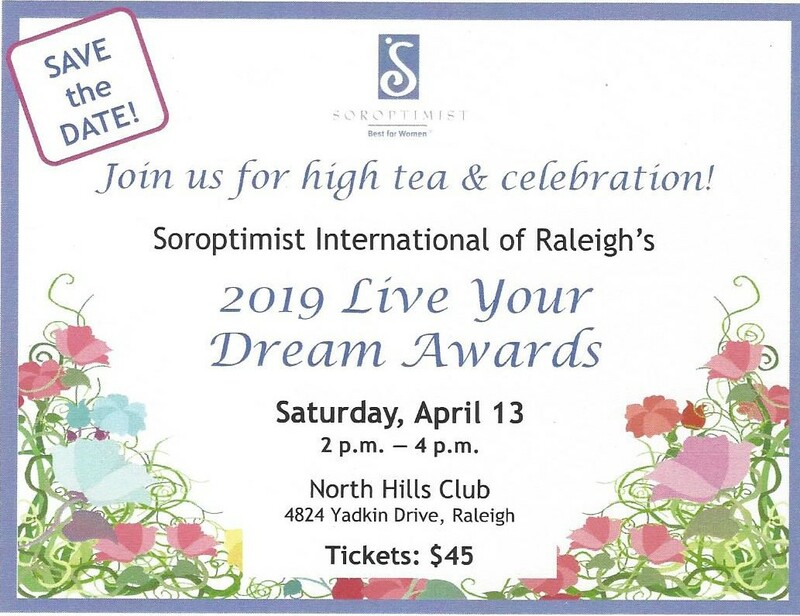 Regional winners are eligible for one of three $10,000 awards from Soroptimist International of the Americas. The application period for the 2019 awards cycle is from July 1, 2018-January 7, 2019. Download the 2019 Live Your Dream Application Form which includes instructions and eligibility criteria. In addition, download the 2019 Reference Form – you will need two copies of this form. First Place Awardee: SHENITA D.
Shenita will receive her Bachelor of Science in Genetics from NC State University this spring. Her goal is to work in research and ultimately to attain a future dual degree in law and medicine. Shenita has overcome many barriers – abuse, teen parenting, and homelessness – while pursuing her education. The eldest of eight children with parents who struggled with drug addiction, Shenita faced responsibilities beyond her years. Later, as a single mother of six, she earned an Associate of Arts degree while working multiple jobs to support her family. Shenita shares her stories of hardship, not to garner sympathy, but to inspire resilience in others. Jennifer will complete her Bachelor of Arts degree at Meredith College this spring with a double major in criminology and sociology. She will begin her career in the field of law as a paralegal. A single mother to three boys, Jennifer has faced challenges of poverty, time constraints, and stress in regard to balancing her role as a parent with going to school while working to provide for her family and pay her education expenses. Positive social change is Jennifer’s life and career goal. Jennifer is changing the world in the present moment by teaching her sons about social justice, our evolving legal system, and respect for all. Sabrina is currently pursuing a Bachelor of Science in Human Development and Family Studies through University of North Carolina Greensboro’s online program. Her goal is to impact children’s lives with the love of learning as a certified teacher. As a single mother with one son, Sabrina earned an Associate Degree in Early Childhood Education in 2009 in spite of many sleepless nights, assignments on overload, health problems, financial setbacks, and the loss of close family members, including her great-grandmother who raised her, her godmother, and her father.